As a participant in a Batterii research study or internal project, you have likely been assigned at least one Batterii Mission. Batterii Missions may have different objectives depending on the project but their frameworks are virtually the same. To successfully complete a mission, it's important to recognize these details. Otherwise, you may miss a deadline or receive a rejection from your mission manager. 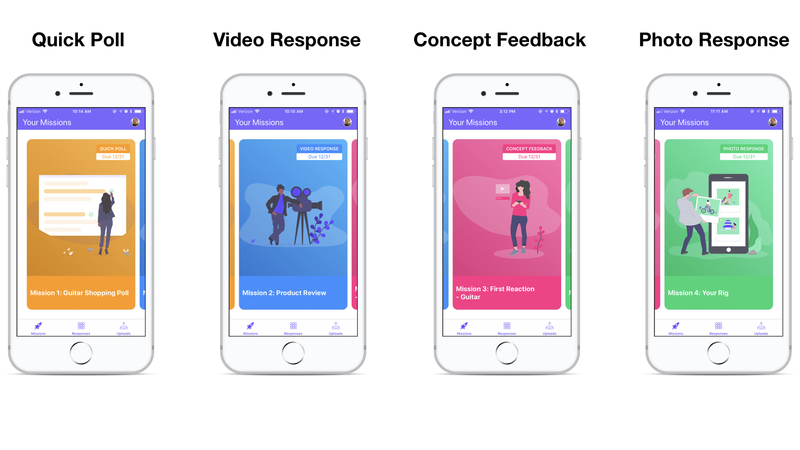 Concept Feedback - Displays a concept or prototype, then asks for your feedback in a reaction video. Photo Response - Instructs you to take snapshots of specific moments and objects. When looking through your assigned missions, you may notice one or several of these types. At a glance, you should also notice the title and status of the mission(s). Mission Status - Provides a quick glance at the progress of your mission. For example, a status with a due date serves as a reminder to complete the mission before the date shown. Other statuses include Submitted, Approved, Rejected, and Closed. Please Note: Missions with due dates will have a specific closing time. To ensure you do not miss a deadline, it is best practice to tap the mission for more details. Mission Title: Serves as point of reference between you and your Mission Manager. If you have any questions in regards to a mission then please refer to it by its title. To find more details, tap a mission and read over its instructions. Deadline - Displays the specific time for when the mission must be completed. Please Note: Times are subject to your local timezone.